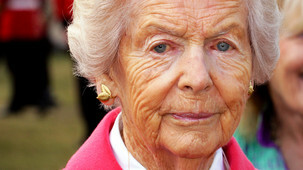 Woman’s Hour devoted a whole programme to an interview with Deborah Cavendish, or as we know her ‘Debo’ – the Dowager Duchess of Devonshire in 2010. You can listen to the podcast here! Deborah Cavendish is 90 years old and has witnessed the 20th century up close. She has met anybody who’s anybody – Churchill, Hitler, JFK. She is also the last survivor of a remarkable set of women – the Mitford sisters: Nancy, who became a writer, Jessica who became a Communist, Unity who became a Fascist – and Diana who married one. In a special edition of Woman’s Hour Jenni talks to ‘Debo’ – the Dowager Duchess of Devonshire about her life, and the times she lived through. In her autobiography ‘Wait for Me’ she also talks about her own personal challenges; her husband, the Duke, had a long battle with alcohol and three of her children died within hours of their birth. She’s also credited with helping to save one of Britain’s great country houses, Chatsworth, which is enjoyed by thousands of visitors each year. This entry was posted in In Tearing Haste, Paddy's Friends and tagged Chatsworth, Deborah Devonshire, Deborah Mitford on September 9, 2010 by proverbs6to10. Perhaps the mother of the current Dowager. Debo was the star of JFK’s presidential inauguration just a few years previous.